The male’s body and wings are gray. His head and neck are green and sometimes when the sun reflects off these feathers he may appear purplish-blue. He has a white ring above his purplish-brown chest, a black rump with a couple of these tail feathers curled up to form small “c”s. His webbed feet are orange and his bill is yellow. He weighs 2.72 pounds. The female has varying shades of brown allover, orange webbed feet and a pale orange bill with a brown saddle. She weighs 2.44 pounds. Both the male and female have a patch of blue on their wings called a speculum. Their wingspan is 30-40 inches. They prefer still, shallow inland waterways. Ponds, rivers, marshes, wooded swamps and lakes are common sites for feeding, nesting and socializing. Occasionally they may be found at sea and in bays during the winter migration. Mallards may be found throughout the northern hemisphere; North America, Asia and Europe. 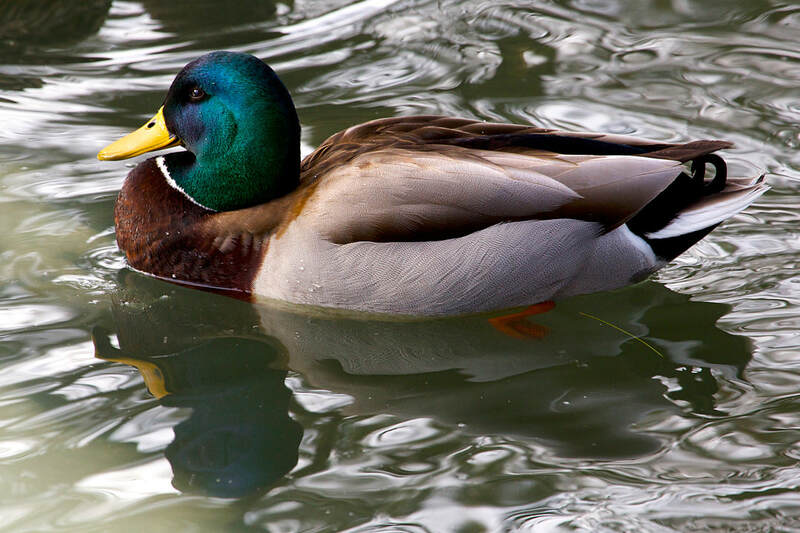 Mallards are dabbling ducks, which means they sift water through their bills. 13 to 15 years, with the oldest on record as 29 years old. The female builds a nest, usually on the ground and occasionally in a hollow tree. She will line it with grass and feathers she plucks from her chest. She will lay 10-12 light green to white eggs. She will incubate the eggs alone for 26-30 days. The young, ducklings, will begin to fly 49-60 days after hatching. 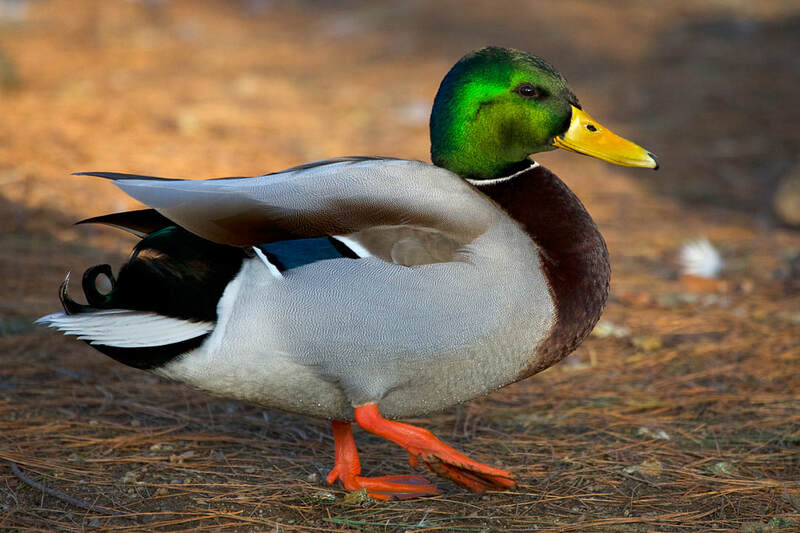 The mallard is one of the most numerous and widespread of all bird species. It is a highly adaptable species that is able to successfully live alongside people. It is thought that the mallard was the first domesticated bird – even before the chicken! It goes by other names such as common mallard, common wild duck, gray duck, green head and even stock duck. If you hear loud quacking sounds coming from a flock of mallards, you are hearing the females. The males make low quacking, whistling and grunting sounds. If the flock is disturbed the ducks can fly vertically up from either water or land and reach speeds of 40 to 60 mph. The mallards in the New England Farmyard at Connecticut’s Beardsley Zoo are not part of the Zoo’s animal collection and can often be seen flying in and out of our pond areas. The mallards come to the Zoo for the food, the water and occasionally looking for a mate.